So I figured I'd put up a few notes from the weekend with some pictures. There is no way I'm going to be able to write up battle reports without pictures, but I can give some rough ideas of how it went. First off the list that I ended up taking. Pretty much a fluffy bunny list, but I've played it enough (minus warptime of course) and it looks good. I was curious to see how the new powers would work out (hint: not impressive). I figured I'd likely go down 0-5 but look great doing it! Not a surprising list to see, maybe adding Nyjal instead or more troops or upgrades on the WG, but otherwise an expected SW appearance at a tournament. The game: Well my shooting worked well early and his didn't. Oblits were able to neuter two of the Long Fang squads early and I didn't take much retaliation fire most of the game. 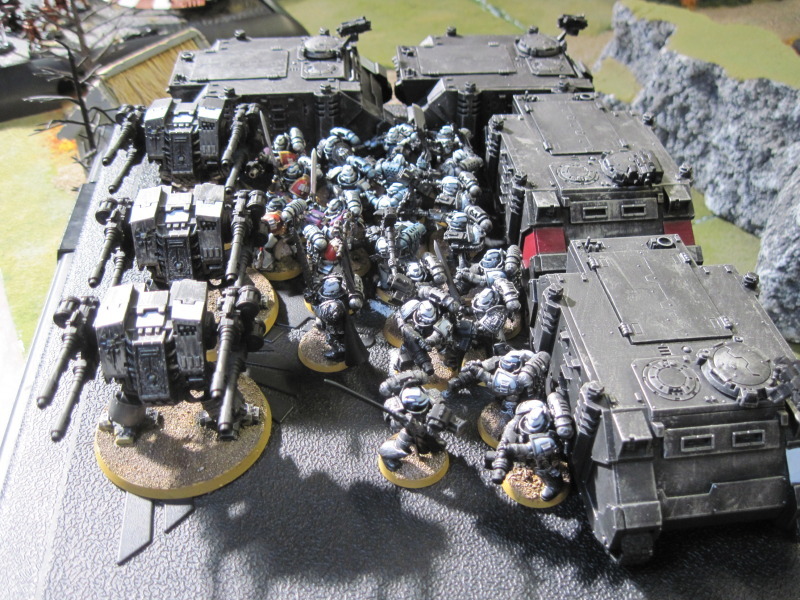 He did have an awesome time with his 5 man squad in finishing off both my lesser dameons and one of my terminators in combat in seperate rounds. Nyjal took a psy wound early. At the end of 5 I had the game locked up as a win, but I was sloppy in how I left off (too close to him). The game went on to 6 and I feared the W would move to a L. But luck was on my side this turn as he failed a key run roll and Nyjal failed his second psy test and croaked. I might have still won regardless, but the game was mine to lose if not for some critical failiures in his last turn. This was a fun game I think for both of us and set a nice tone for me for the tournament. I'll keep this brief since this ended up being at 1800 point list. So I'm looking at this going 'there is no way I'm going to get through those MCs' never mind all the genestealers as well. The game: Even though I lost this game, and despite the ridiculous points, I'm really most upset because this is the only game I felt like I made a critical tactical failure. It was DoW and I went second, and I walked by oblits too close to the board edge. I wanted to get a clear shot on his Tervigon, and I thought 'this is 16", he probably can't assault me." Queue the music for the 18" assault the genestealers pulled. Had I kept my distance I would have had a chance to get some flamer action going perhaps. It might not have changed the result but I am still kicking myself. I was locked in combat with MC and sons and with no warptime could not manage to get enough force weapons attempts, and the one I did failed. Also I had several chances to spawn the MC but alas failed do so as well. Despite all of that if the game had ended on 5 we were tied and it would have gone to VP (which I shockingly would have probably lost since he had 1800 pts). But on to turn 6 it went and it was a big loss. The Game: If my victory against the SWs was because of a few critical dice failure on Jon's part, this victory to me was Joel's 'death by a thousand cuts.' The dice did not want to have anything to do with him, and I played well and rolled average. There isn't much more that can be said. I will say his lash was more useful than my powers, despite Bolt of Changing one obliterator and Spawning another. 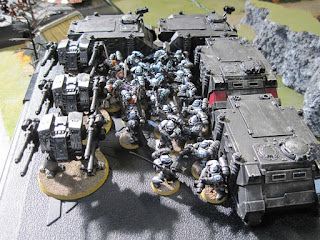 The Game: This was a game I though I might be able to win if I could get to those troops, but I knew that many terminators were going to be a problem. Things started well early with my DP and a termicide squad destroying his two predators. But before the DP could wade into those 5 man squads a bolt pistol took the first wound the the f'n TYPHOON said 'I'm not goin down like a punk' and went to town and took the last 3 Ws in 1 round of shooting. 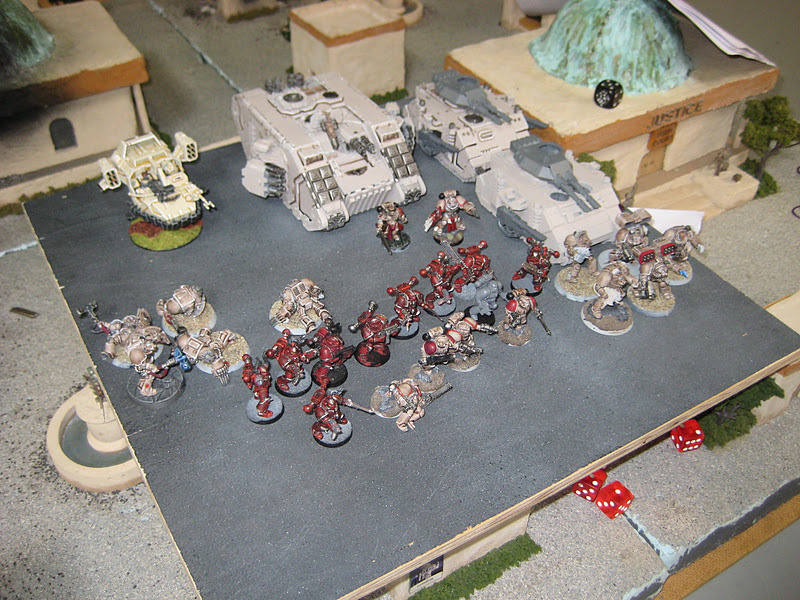 My other termies could not pop the LRC and that led to trouble for most of my troops. This is another game that had the game ended on 5 it would have gone to VP (which again he would have had me easy) but on turn 6 we was able to move troops to objectives for a clear win. Still it was a fun game! Not that there are any great match ups for 1ksons (slogging marines on planet bowling ball?) 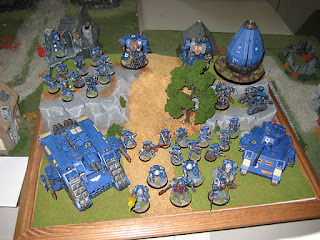 but this was one army I knew would pretty much be my doom. The Game: You know we were playing for fun when we didn't even pick the 'kill this target' until the end of turn 1. Oops. We rolled off to be fair, we both got dreadnoughts, but mine had already died! Comedy gold! The next turn Crowe took his 2nd wound (first was from DP) from my exploding rhino and died. Comedy gold! His Dreads ended up in CC with 1ksons who had no ability to kill them. The dreads were killing 2-3 sons a round from failed saves and failed fearless saves. Comedy gold! I was thoroughly whooped on this game but we did a lot of laughing. At the end of 5 it might have been a tie (we didn't bother measuring distances to objectives) though I would have lost VP certainly and it went on to 6 for a solid loss. So those were my games. Overall I can say I do like playing my 1ksons for fun but they are (wait for it) horribly uncompetitive. I mean they struggled before the warptime nerf and now even more so. I honestly think I may go back to warptime on the aspiring sorcerers w/ meltabombs. For one the getting punk'd by dreads was an eye opener. Spawning was pretty much usless, and really the warptime for the chance to land those force weapon hits are more valuable, even if it is roll all the dice. Sure they can win the occasional game but it takes bad luck really on the opponents end most of the time. Of course that's assuming I play these guys anytime soon. With the next tournaments on the horizon I'm definitely looking at my more competitive lists to take, and then we'll be into 6th edition. Here are some other pictures of some cool looking armies at the event.